In about a month, I am competing in the ITU World Duathlon Championship in Aviles, Spain. Then, about three weeks, later, it’s on to USAT Duathlon Nationals (with a rather hilly bike course). Yet in the last two races I’ve been in, my legs have taken an unusual beating. Here’s a quick post on an idea that I have for solving this problem. First, let me explain the problem. After the Spring Classic Duathlon last weekend, my legs were sore for three days after the race. Sure, my legs feel tired for a day or two but then I’m usually right back in the swing of things. This time, my legs were painful to the touch. And then when I used my R8 Recovery Roller, the pressure of the rollers was unbearable and I had to very gingerly ease my way into it. Then, this weekend’s Mount Rainier Duathlon pretty much left me in the same condition. Worse yet, coming off the bike, my quads were toast and I couldn’t run faster if I wanted to. This kind of suffering is relatively new to me. I usually don’t hurt this much after a race. I didn’t hurt this way after the hard (and much much faster) 5-K’s earlier in the winter. And I don’t recall hurting this much in any of my duathlons for the past few years. I sure hope this isn’t a sign of what’s to come with old age! While I was trolling the internet, it occurred to me– I could use my Compex to eliminate this condition! In my past review of the Compex, I mentioned almost in passing that the Compex can help develop “burn proof quads.” The idea is simple enough– you simply attach the Compex to your quads (or whatever other muscle needs to be invincible in a race) and set the device on either “endurance” or “resistance” setting and go to it. If you do this for about 3 weeks, you’ll notice it becomes really hard to fatigue the muscle in your day-to-day activities. But be careful. In my experience, this works really well on your quads, pretty well on the glutes, and less effectively on the hamstrings and calves. Well, “effective” might not be quite the right word. Instead, an EMS device on these muscles has greater collateral damage than working your quads plus these muscles tend to suffer less than the quads in a race. Specifically, a Compex endurance or resistance session can leave my calves and hamstrings feeling sore and tired for days afterwards, making it far less fun to train. And usually it isn’t fatigue in my calves or hamstrings that slow me down in a race. After hard workouts or races over the next month, I’ll use the Compex endurance program on my quads, glutes (including my gluteus medius), hamstrings, and calves. To prevent the aforementioned fatigue, I’ll turn it down quite a bit on the hamstrings and glutes. By doing the hard workout before using the Compex, any fatigue from using the Compex will have minimal impact on my “real” workout. Doing each muscle group separately would take about 3-1/2 hours– way too much time! So instead, I will do only 30 minutes of the 50 minute endurance session and skip the warmup. Also, I’ve found that I can work two muscle groups at a time if I just connect each pair of electrodes to the muscle motor units and skip the location reserved for the red electrode. For instance, if you were stimulating your right quadricep, Compex would tell you to use two pairs of electrodes– put one electrode on the inner and outer quadricep muscle and connect both red electrodes to a two-snap pad placed at the muscle insertion point. Instead, just use one pair of electrodes and connect them to the same inner and outer quadricep muscle. I find that I have to turn the power up roughly twice as much but I can work two different muscle groups. For instance, you can work the left and right quadriceps and left and right calf muscles at the same time. 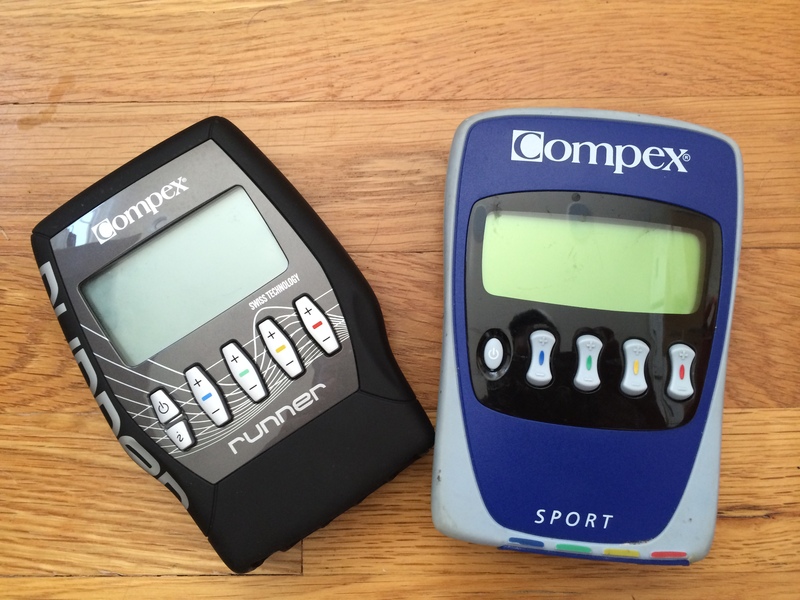 In combination, these strategies reduce a nearly 4 hour Compex session down to a one hour. I’ll continue to use the Compex recovery mode whenever I feel like I need a little extra recovery. I’ll discontinue using the Compex about a week before each race to make sure that my legs are as fresh as possible for the race. We’ll see how this works. If it all works out, I’ll post my thoughts on how it worked– and what I could do better.